This post about USC’s Marshall School of Business focusing on management consulting is part of a series of interviews about top MBA programs called “MBA Career Goals and the B-Schools that Support Them.” Please subscribe to our blog to ensure that you receive all the interviews exploring the elements at each school that support career goals in finance, consulting, general management, entrepreneurship, marketing and more. What kind of background and skills do you like to see in applicants expressing interest in a career in consulting? For a career in consulting, students do need a business background. If they want to practice in a particular industry, they need industry experience. But as a baseline, they need to understand how business operates. What aspects of your curriculum do you feel are best suited to students who want to eventually pursue a career in management consulting? Marshall has a considerable number of classes in management, as well as courses in financial modeling—all topics from which consultants draw knowledge and learn to formulate and apply strategy. In addition, the school provides opportunities for students to secure consulting internships. While the above coursework provides the foundation for a career in consulting, Marshall has also changed its curriculum to allow for more flexibility and greater choice of electives. With this variety of courses, our students tend to be very well rounded—which serves our graduates well when they act as consultants across industries. In addition, since we train our students to develop a global perspective and as mandatory part of curriculum the students visit companies in different countries via experiential learning trips–Marshall students learn to appreciate the dynamics at play in different corporate cultures. 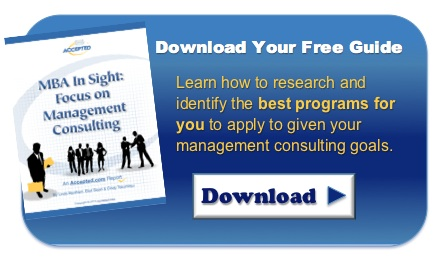 This helps our students succeed as consultants. The Consulting and Strategy Club includes professional development and networking and relationship building. In addition it provides case and interview preparation. The L & O Club (Leadership and Organization Club) is for those students who are interested in management and leadership development. The club also is a hub for students who are interested in pursuing management rotation programs, corporate HR, and human capital or HR consulting. Also there are clubs that pertain to certain industries. In addition to the support of a dedicated career services advisor, Marshall Consulting Club’s Case Certification Program prepares candidates for case interviews. Members receive a set of around 60 practice cases and access to a library of hundreds of additional cases from major consulting firms as well as our peer business schools, two days of mock interviews and advice and guidance through the entire interview preparation process. The process culminates with candidates interviewing with top-tier professional consultants who make a final decision on awarding the case certified status to the candidates. For 10 years, USC Marshall has been hosting the Marshall MBA Global Consulting Challenge, an annual case competition that challenges the problem-solving of MBA students from the world’s leading business schools. Students get to showcase their skills and connect with executives from top companies and industry executives who assess their performance—introductions which can put our students top-of-mind for job interviews and professional opportunities. The Global Consulting Challenge has allowed students to meet with executives from companies such as Cingular, Intel, Toyota, Twentieth-Century Fox, AT &T, Electronic Arts and Hewlett Packard. An outgrowth of this competition is an ongoing student consulting practice that operates out of the Consulting Club. Since management consulting is a very broad term, can you break down some of the sub-categories in the field that USC Marshall excels in? Which management consulting firms recruit the most USC Marshall graduates? What kinds of positions do your graduates focused on consulting generally go into? Normally, our students receive offers and take positions as senior consulting associates. Thanks to Amy Blumenthal in Media Relations at the USC Marshall School of Business for granting us this interview. Last updated on August 14, 2014.